Glenn Irwin expects to return from injury at Brands Hatch this weekend. Glenn Irwin expects to make his return from injury in this weekend’s MCE British Superbike round at the Brands Hatch Indy circuit in Kent. Irwin has missed four BSB races after crashing in free practice at Knockhill in Scotland last month, sustaining shoulder and elbow injuries. The PBM Be Wiser Ducati rider’s hopes of making the all-important Showdown have taken a battering, with Irwin slipping to ninth place in the championship standings. 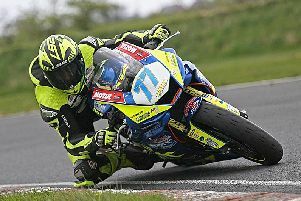 Prior to his crash at Knockhill, the Carrick man was fifth after the opening three rounds, with Irwin securing rostrum finishes on the Italian Panigale R machine at Donington Park and Oulton, where he sealed his best result in the British Superbike Championship to date with a superb ride to second place. Assessing his chances of being on the grid for Sunday’s races at Brands, Irwin said: “I’m just out of yet another hyperbaric chamber session and I must thank the Simon Andrews Foundation for their assistance in my recovery. “As a result of this intensive treatment, this weekend now looks very promising although I will do as little as possible until it really counts on Saturday afternoon. Meanwhile, Jordanstown’s Andy Reid is preparing for his second BSB meeting on the Tyco BMW after replacing Davide Giugliano in the Moneymore team. Reid finished 17th and 18th on his debut on the S1000RR at Snetterton and will continue his development as a Superbike rider at Brands, where he will be joined by Christian Iddon as the Stockport rider makes his comeback from injury after a crash at Knockhill. Reid said: “I know we can keep moving forward and pushing that number 18 Tyco BMW closer to the business end of the championship. In the Dickies British Supersport Championship, Northern Ireland riders Keith Farmer, Andrew Irwin and David Allingham will resume their title battle this weekend. Farmer and Allingham are tied on 145 points while Irwin is only five points behind. Dublin’s Jack Kennedy is also in contention on his MV Agusta, with the former World Supersport rider 20 points behind Irwin.